It is with great sadness that the family of Patrick Pfefferle announces his passing on Tuesday, June 19, 2012, at the age of 58 years. Patrick will be lovingly remembered by his wife, Rita; children, Neil, Tim (Jackie), and Jason (Kasia). Pat will be fondly remembered by his two grandchildren, Logan and Jaxon. He will also be missed by many of his colleagues and friends. Patrick was predeceased by his parents, Adeline and Leo and brother, Douglas. 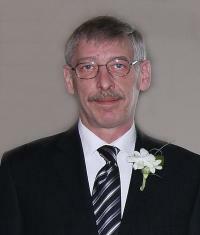 A Funeral Mass in memory of Patrick will be held on Friday June 22, 2012 at 10:00 a.m. at the St. Charles Church, Edmonton 17653 112 St, with Rev. Frank Kuczera officiating. Those who desire may make memorial donations in memory of Patrick to CapitalCare Foundation, (Norwood Palliative Care) 10909 Jasper Avenue NW, Edmonton T5J 3M9 or a charity of one’s choice.